Rafael Gomez, pictured above by courtesy of Getty Images, set a new course-record to lead the Costa Blanca Benidorm Senior Masters by three shots at the end of the opening round at Meliã Villaitana today. 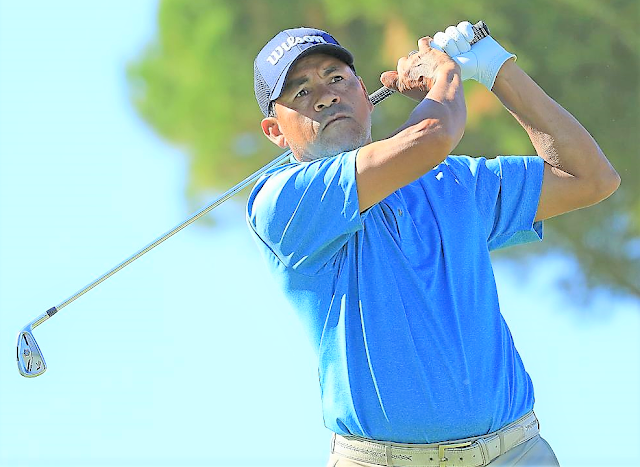 Gomez recorded his lowest round of the year with a bogey-free eight-under-par round of 64 to take the lead ahead of Stephen Dodd at the sun-kissed Benidorm course. However, he started the inaugural Costa Blanca Benidorm Senior Masters in stunning style with four birdies and an eagle on his front nine, including three successive gains before the turn. With the sun beating down, Gomez remained calm and birdied the 11th and 15th holes to return to the clubhouse without dropping a shot, something he was particularly delighted about. “It was a perfect card without any bogeys, so I’m very happy with it,” he said. “I left a lot of chances on the course as well, so it could’ve been lower than eight under par. “It was nice to finish the way I did because I was struggling a lot on the back nine,” he said. “I didn’t hit a lot of good shots, but I hit some good ones towards the end, which was nice. “It was nice to be out there today. The course is in great condition, so it made for a nice round of golf.